WE'RE ON THE MOVE!! AND LOOKING FORWARD TO SETTLING INTO OUR NEW VINYL LOVING HOME: JACARANDA RECORDS PHASE ! PHASE ONE is proud to announce it is teaming up with the long established PARRJAZZ to create the BEST weekly Jazz night in Liverpool. 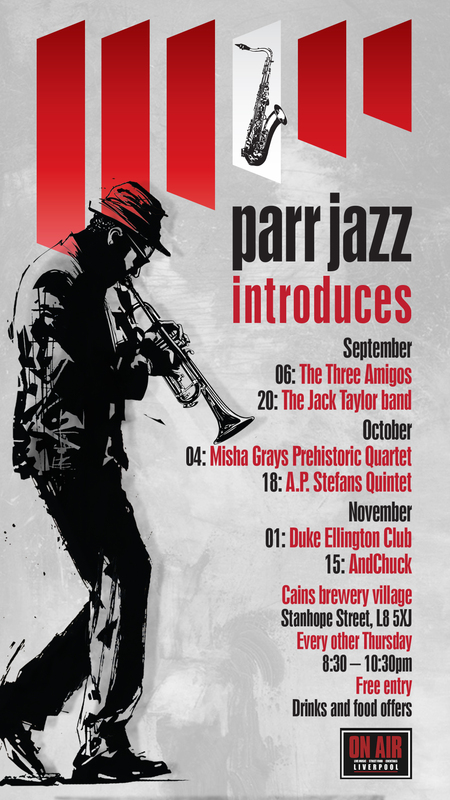 PARRJAZZ Tuesdays have grown over the last 10 years to become the best established jazz night in town and the move to Phase One will see this continue in a space that is ideal for Live Music and music lovers. Housed in a Georgian warehouse and part record store, bar and live music venue Phase One is the place to be for live music across the city. Since opening in May 2018 it has fast become one of the finest live music venues in the city centre with a wide variety of live music events every week. With a swinging resident house band and weekly featured international guests, Parrjazz is not one to miss for jazz lovers. Previous guests have included big names in the Jazz scene such as Snarky Puppy, Get The Blessing, Dennis Rollins, Go Go Penguin and many more. Future bookings will see that variety and notoriety continue. 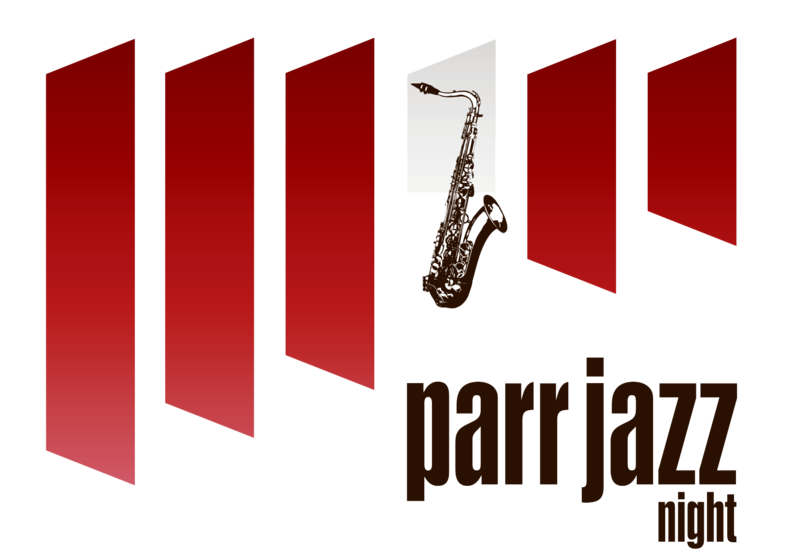 PARRJAZZ is a Not For Profit organisation set up and run by musicians, for musicians and music lovers. Phase One and Parrjazz’s collaboration is set to enhance the already vibrant jazz scene in Liverpool and create a platform where all varieties of Jazz are celebrated and housed under one roof, promoting both Live Music Venues and Future Jazz. 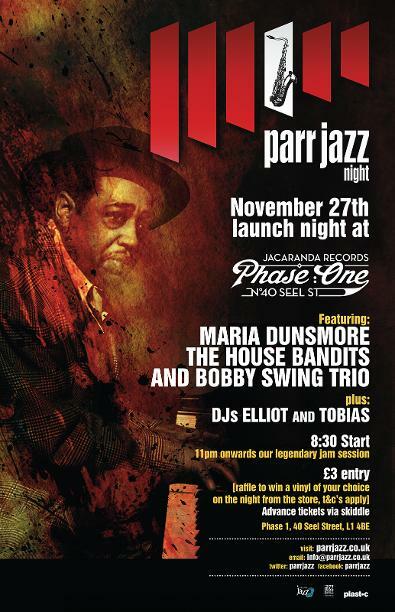 Parrjazz will launch at Phase One on November 27th. Parrjazz introduces @ On Air showcases the best of new and emerging jazz acts in the country . Highlighting the fact that jazz is enjoying a resurgence with musicians not afraid to experiment . It’s an exciting time and we’re delighted to be teaming up with the remarkable venue ‘On Air’ at Cain’s Brewery Village , an incredible setting for improvisation ! Great Feature in Culture Liverpool about Parrjazz ! “I don’t like Jazz, but I liked that!” How many times have we heard that? Liverpool’s Parrjazz was started by musicians in the optimistic atmosphere created by Liverpool Capital of Culture, 2008, and for over 10 years they have promoted top international players: Snarky Puppy/FORQ/Gogo Penguin/Alan Barnes/Dennis Rollins and loads more. Parrjazz has introduced and supported new players as well as developing venues: Studio2/On Air/Ma Boyles/Frederiks. Parrjazz, led by musicians, is non-profit and supports new talent, from the LIPA guys to those making the move from rock, pop and soul to walking on the Jazz-side! Several gigs every night of the week make Jazz, in all its forms, a booming part of Liverpool’s music scene. Tuesday’s Parrjazz delivers a storming jam session in Studio2 Parr Street with jazz touring players – they’ve had Japanese martial arts rockers and American proggers playing with students and Liverpool schmoozers. The menu is wide. Angular free-jazz, early roots, ragtime, classic swing, the coolest cool cats, jazz-rock fusion, prog, funk and trippy youngsters working their way out of the trancey psych soup. What’s been happening this year? Summer to autumn in Liverpool has seen spectacular artists. June was kicked off into a dark gothic castle by Liverpool’s own Blind Monk Trio cascading Black Sabbath/Stranglers/Coltrane at Ma Boyle’s Alehouse and Eatery; the local vicar sat outside, cigar and a single malt. The rest of June in Studio2 was a blast. San Francisco’s Paul McCandless with Charged Particles, closing off with a packed house for USA’s finest Prog/Fusion outfit, FORQ, touring their latest record Thrēq. FORQ’s storming acid-jazz rocker Cowabunghole created a jazz mosh pit! July gave us The California Jazz Conservatory showcasing west coast talent. Nashville’s Suzahn Fiering gave us a master class in songwriting. As August broke, Barry’s Boptet smashed out the best of Be Bop – Herdsmen to Miles Davis. Sax legend Dean Masser carried on the theme. September, had Guitar/Hammond/Drums combo Tobie Carpenter Organ Trio, touring their debut EP Dead Pan Party. October is a jazz-feast. Leading UK Jazz talents Brigitte Beraha’s Babelfish on the 2nd, UNMISSABLE Bristopian jazz-trippers Get The Blessing on the 11th (Tickets from See Tickets/Skiddle), Robert Mitchell’s Epiphany 3 on 16th, guitarist Stuart McCallum on 23rd, with the insane Baked A La Ska Halloween Special on the 30th. 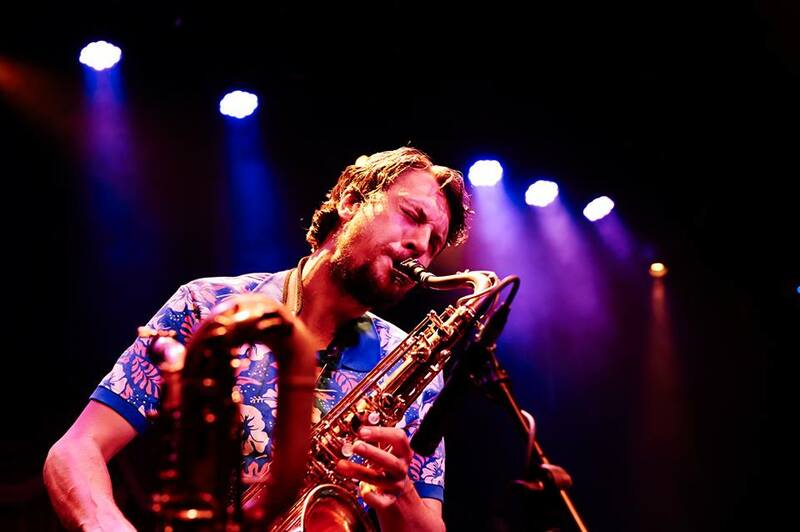 November will feature two sax heavyweights – Benn Clatworthy and Greg Abate………… nice! With big news comes a big party, Getintothis’ Matthew Wood has the low down on ParrJazz’s move back to Parr Street. Following a successful stint at Hope Street’s unique bar, Frederiks, Liverpool’s best-established jazz night ParrJazz makes a return to Parr Street’s Studio 2, reigniting an old flame for new beginnings. To welcome the return, Studio 2 will be hosting a monster launch party with special musical guests, all vinyl-spinning DJ’s and free scran and booze to those in attendance. Through the years, ParrJazz has consistently hosted world-renowned jazz talent free of charge every Tuesday. Past guests include Snarky Puppy, Benn Clatworthy and Victor Brox who is known to have jammed with Jimi Hendrix in his time, plus a royal host of upcoming youngsters and local veterans. The launch party will continue in equally commendable fashion on June 5 and will feature saxophonist Chris Rand, a major figure in the world of jazz and blues having toured and recorded with the likes of Charlie Watts and Ronnie Wood, acclaimed session-soloist Elliott Randall and members of Ian Dury & The Blockheads.